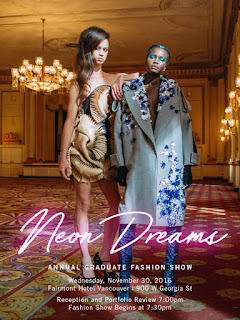 November 30th, Blanche Macdonald held their annual fashion design grad show at the Fairmont Hotel Vancouver. 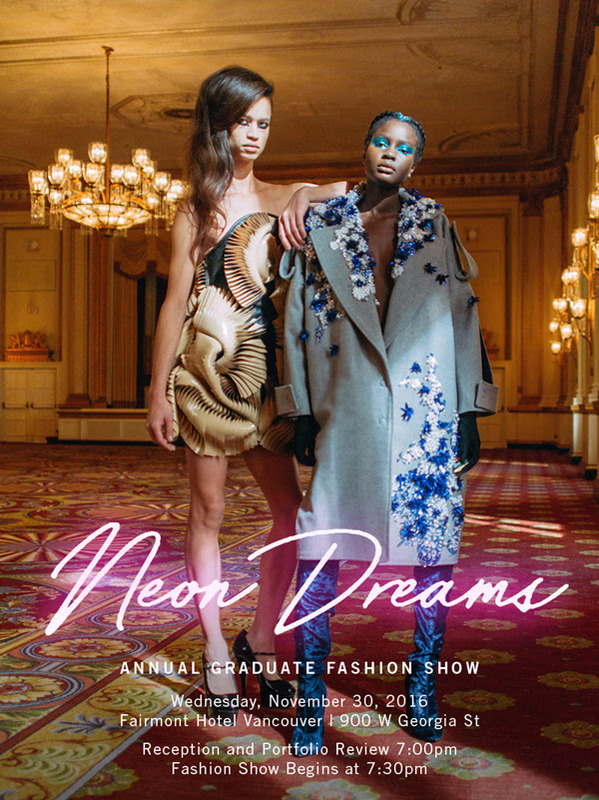 Called Neon Dreams 2016, the school offered a larger show of 41 students in the afternoon and an edited highlights show featuring 25 students in the evening. Each grad showcased two looks from their collection. My first Blanche show was in November 2007 and I haven't missed one since. In fact, I never miss a student grad show if possible. These students are in their infancy in the industry, but offer a glimpse into where fashion is headed. After watching the great looks featured on the runway this evening, I can assure you, the future of fashion is in good hands. Before every show, Blanche Macdonald offers a chance to view the student portfolios, something I ALWAYS make time for. In addition to seeing how professional their book is, I look closely for those with strong illustrations. As they are just starting out on this career, I feel strong illustrations gives me a glimpse into their creative potential. The lobby area is also set up for guests to mix, mingle and enjoy a drink or bite from a wide selection of tasty offerings. There are always many industry professionals, friends and former students to catch up with during this time. When the doors open, there was a rush as everyone tried to snag that perfect view. No worries, The runway was high enough for everyone to see easily no matter where they sat. An additional bonus for VIP's attending was the fabulous gift bag waiting at their seat. Our emcee this evening was the lovely Jaylene McRae. She has hosted several of these grad shows and always does a wonderful job. The models sported unusual make-up. There were bright colours eye colours topped with gloss and strong lips including a bright turquoise. The looks were created by key makeup artist and @BlancheWorld graduate Kelseyanna (@kelseyannaf) who is repped by NOBASURA. This was perfectly complimented by a lovely side pony from key hairstylist BMC Hair instructor Lisa Callender (@lady_callender)! With 25 collections being featured, you would expect the show to feel long. Instead the time flew by and we were left wanting more. What stood out for me was the diverse variety of aesthetics. This group of new designers offered a bit of something for everyone.